Textbooks and supervisors can provide suggestions on what words to use in situations that can provide the client with the verbal recognition of his/her emotional condition. In relation to the “neurobiology” of empathy, my theory is that it relates to the cortical hemispheres (Moss, 2006, 2007, 2010, 2013; Moss, Hunter, Shah, & Havens, 2012). The left hemisphere for most individuals is dominant for spoken language. Thus, the therapist can learn the verbal components and, in turn, voice this to a client’s left hemisphere relatively easily. 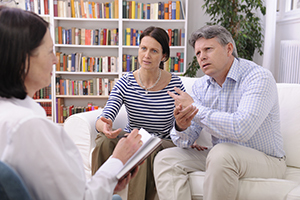 Over time a therapist learns more statements and practices these across clients. If accurate information is given to the client, the verbalized descriptions (processed by the client’s left hemisphere’s “verbal interpreter”) provide an explanation for the non-verbal emotional processing of the client’s right cortex. I (Moss, 2013) have suggested this reduces the conflict (allowing “interhemispheric congruence”) between the two sides with the result being that the client perceives more self-acceptance, internal peace, and may experience an emotional release (e.g., becoming tearful). The self-acceptance involves the left hemisphere’s verbal interpreter recognizing the right hemisphere’s emotion is reasonable (i.e., developing a new schema). The internal peace is a function of decreased inhibitory activity between the right and left frontal lobes. The emotional release is a function of decreased left frontal inhibition on the right frontal lobe which controls the behavioral expression of affective responses. Few neuroscience professionals will contest the fact that all people learn a “native” verbal language based on the language to which they are exposed during childhood. This appears to occur bilaterally to some degree initially. Yet, the capacity of the left hemisphere to handle the detailed memories tied to spoken language likely leads it to assume final primary control. Similarly, the quick and efficient processing in the right hemisphere allows it to effectively handle the non-detailed analysis and expression of non-verbal emotional components in relationships. Just as we develop a native verbal language of the left hemisphere, we develop a “native emotional language” of the right hemisphere. For those “natural” empathic individuals, the native emotional language they learned as a child involved those non-verbal skills. The critical period for learning two languages and being truly bilingual is around the age of 8. It is possible to learn a second language later, but it will not ever be perfected. If what I have described is accurate, we learn our native emotional language and this will be with us for the rest of our lives. For those who developed empathic non-verbal skills early, these will remain and only get stronger. Perhaps these individuals have the ability to become “super” therapists, but not even be aware of exactly how they are accomplishing such therapeutic effects. For those who are not “naturals,” they can still get quite efficient in non-verbal therapy skills with sufficient training and experience. However, they will be comparable to someone who developed the use of a second verbal language after the critical period. I hope this may stimulate some thought for the readers. My articles listed below are available on my contribution page at researchgate.net and academia.edu, as well as at my website www.emotionalrestructuring.com under current papers. Moss, R. A. (2006). Of bits and logic: Cortical columns in learning and memory. The Journal of Mind and Behavior, 27, 215-246. Moss, R. A. (2007). Negative emotional memories in clinical practice: Theoretical considerations. Journal of Psychotherapy Integration, 17, 209-224. Moss, R. A. (2010). Clinical Biopsychology: Could A Grand Theory Actually Exist To Allow True Psychotherapy Integration? Independent Practitioner, 30, 67-71. Moss, R. A., Hunter, B. P., Shah, D., & Havens, T. (2012). A theory of hemispheric specialization based on cortical columns. Journal of Mind and Behavior, 33, 141-172. Moss, R. A. (2013). Psychotherapy and the brain: The dimensional systems model and clinical biopsychology. Journal of Mind and Behavior, 34, 63-89. Brilliant article Robert, thanks for writing and sharing, I particularly like the idea of the “what” vs the “how” of empathy and the neuroscience perspective on this. The parallel with language learning is very compelling, and it seems it’s not impossible to learn to become fluent in empathy as an adult (just as adults can become fluent in other languages, though never quite the same as a native speaker) – but it is way harder than if this is learned in the critical period. I’ve had discussions with colleagues and in supervision about what makes a “natural” therapist and this seems to go some way towards providing some kind of answer to that. Very interesting, thank you, I will be checking out more of your work!